An-Mar Wiring Systems is a manufacturer of custom wire assemblies containing NTC thermistors, diodes, and other passive components. An-Mar can place a thermistor into a BeCu clip, a stainless steel can, a threaded brass probe, a ring terminal, a PVC shrink cap or something unique to your application; we welcome the opportunity to help you. 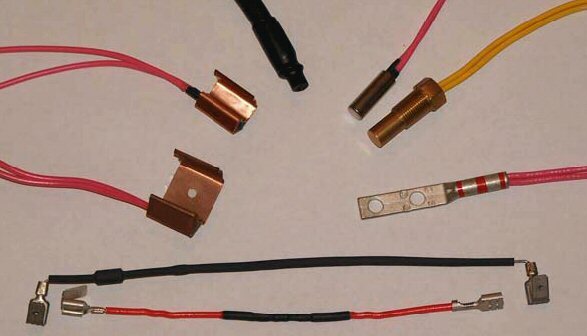 An- Mar can also provide you with wire assemblies to be used as jumper wires with a resistor or diode spliced into it. Please feel free to contact us via phone, Fax or E-Mail for a custom quote on your manufacturing needs. A handy 'Request for Quote' E-Mail Form is available for use by clicking on the 'Quotes' Link above.